Like many of you (I hope), I welcome this new blog format for exchanging thoughts and ideas in the global structural geology and tectonics community. I am writing only the first of a series of monthly pieces that will appear during 2013, a way for the Structural Geology and Tectonics Division to commemorate the 125th anniversary of GSA. I hope this initiative will continue beyond this year and will evolve into a new platform for sharing ideas and experiences. Here I write about a philosophy used by many research groups that are studying deep crustal processes. At the University of Minnesota, we call this approach (and our research group) STAMP (Structure, Tectonics, And Metamorphic Petrology). The group is composed of my colleagues Donna Whitney and Peter Hudleston, a few postdocs, a group of graduate students (the dynamic core of STAMP), and some undergraduates who are involved in research projects. We also have collaborators in the US and overseas, like Patrice Rey (Sydney) and Haakon Fossen (Bergen). STAMP was born out of necessity, when we started to study the partially molten crust. For such research, structural and metamorphic geology cannot be dissociated. Ten years ago a group of Minnesota graduate students came up with this acronym, and it stuck. The initial group was focused on structure and metamorphism, but more recently STAMP has included research from deep crust to surface, where thermochronology intersects geomorphology. In this post I develop two themes that illustrate how STAMP approaches the exhumation of deep crustal rocks. These examples give a flavor for the degrees of “STAMPiness”, a scale we use semi-quantitatively to depict our more or less STAMPy research projects. One theme is the rise of partially molten crust from deep to shallow levels in the crust, and the other theme is the exhumation of ultrahigh-pressure (UHP) rocks. These examples capture the breadth of STAMP because they involve stress and strain analyses as well as thermobarometry and understanding of the interaction of deformation and metamorphic reactions. We use mapping on various scales and define structural overprints within progressive deformations. We link strain, metamorphism, and rheology through microstructural analysis, and of course we make extensive use of modern and increasingly powerful geochronology, without which tectonic studies are a waste of time, pun intended. The problem of how the deep crust ascends toward the Earth’s surface is a perfect playground for STAMP, whether this crust fills migmatite domes in metamorphic core complexes or brings back pieces of UHP eclogite. In the first example, metamorphic rocks that reach their ultimate fate – melting – may be “pumped” like a fluid toward the Earth’s surface when extension in the brittle upper crust opens a low-pressure region. During ascent from ultra-depth in the second example, deformation and metamorphism interact in such a way that structures and fabrics can be assigned to specific segments of the P-T path, from UHP to low P.
Deep or ultra-deep rocks follow a journey in P-T space that is partially preserved in the fabrics and metamorphic minerals and textures in the rock, owing to the petrologic variety of continental crust. For example, mafic layers, boudins, and pods retain the highest P-T conditions, and in some cases cease deforming during ascent. Another example: when coesite turns to quartz during decompression of UHP rocks, the concentration of Titanium in quartz, a calibrated thermobarometer, may track the P and T of deformation, since Ti mobility is highly dependent on dynamic recrystallization processes, in particular grain boundary migration. Today, analytical possibilities are almost endless; the sky is the limit, or rather the wallet, because these techniques are expensive (e.g., time on the ion microprobe or ICPMS). The rise of partially molten crust, expressed as migmatite domes within core complexes, can be explained by rapid ascent of the hot and fluid crust to the footwall of detachments (Fig. 1). Field-based data (metamorphic, thermochronologic) indicate that 1 GPa rocks are now at the surface, that they came within only a few kilometers of the surface during their ascent, and they crystallized under low-pressure conditions. Fig. 1: Exhumation of low-viscosity (partially molten) crust and formation of migmatite domes in metamorphic core complexes. Initial orogenic crust is thick (>60 km) and Moho temperature is ~900°C (after Rey et al., 2011, and Whitney et al., in press). Structural studies of migmatite domes of the North American Cordillera (Thor-Odin, Okanogan, Pioneers) and the Aegean domain (Naxos) have shown that, although the mantling units have a relatively simple structure that wraps around the domes, the internal structure of domes is complex and characterized by multiple fold generations and fold interference on various scales, multiple sub-domes separated by tight synforms, and steep shear zones separating panels of flatter foliation (Kruckenberg et al., 2011, McFadden et al., 2011). Numerical models in 2D help explain the metamorphic and structural evolution of domes, particularly when models include a “melt” function (Rey et al., 2009, 2011a&b). This relation states that for material at temperatures above the solidus (most of the lower crust, Fig. 1) viscosity decreases as a function of melt fraction. Incorporation of this melt function generates a low-viscosity channel in which material converges as soon as the brittle upper crust extends (top panel, Fig. 1). The dynamic link between extension of upper crust and flow of lower crust has the double effect of localizing displacement on a single fault in the upper crust (rolling-hinge detachment zone) and advecting the low-viscosity crust in a positive feedback loop. The solidus is advected to shallow depth, explaining crystallization of migmatite at low pressure. During ascent, rocks successively enjoy shear deformation in the channel, contraction structures in the zone of vertical flow, ductile thinning, and finally mylonitization and possibly brittle deformation in the detachment shear zone. 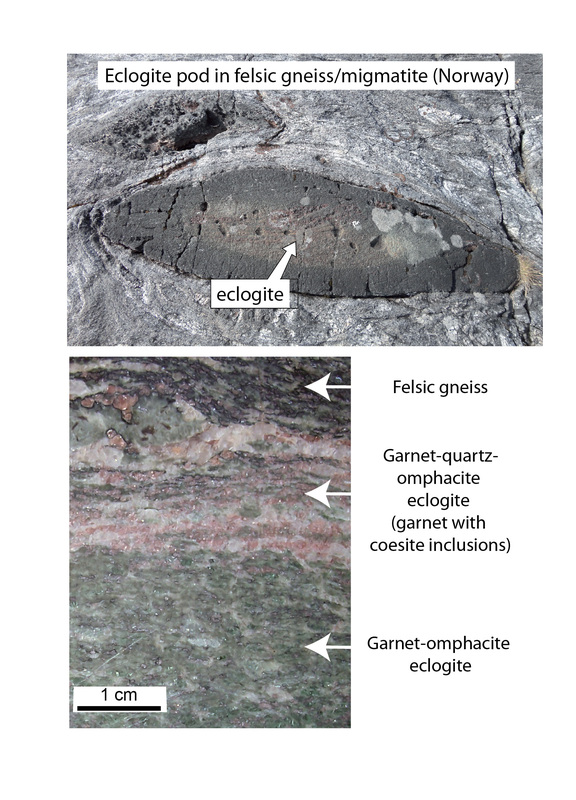 This complex history sheds light on the complexities encountered in the core of migmatite domes, while their margins are typically made of a simple, doubly-plunging antiform. Recently STAMP has begun working on the problem of exhumation of giant UHP terrains by focusing on the Western Gneiss Region of Norway. UHP rocks are hosted in migmatite and gneiss as mafic layers, boudins, or pods (Fig. 2). Previous work has pointed out the corrugated nature of the terrain over a 100 km scale and the preponderance of linear fabrics and evidence of constrictional strain. We are working on this hypothesis: following continental subduction, exhumation of this UHP terrain was the result of oblique divergence within the Caledonian orogen. Fig. 2: (top) Mafic pod in Western Gneiss Region, Norway, with eclogite core, retrogressed (amphibolite) rim, and felsic host. (bottom) Polished slab of eclogite/felsic host contact; in this case, the coesite-bearing eclogite is a ~3 m thick layer concordant with felsic gneiss layering. Omphacite crystallographic fabrics are shown in Fig. 3. Oblique divergence leads to transtensional strain, including folds of horizontal layers that form with hinges nearly parallel to the stretching direction (horizontal shortening). Transtension also predicts vertical shortening that is accommodated by crustal thinning and detachment shearing. Horizontal and vertical shortening are compensated by horizontal stretching, resulting in strongly linear fabrics (L-tectonites) and boudinage of competent layers in a direction parallel to fold hinges that tracks the oblique divergence vector at high finite strain (Fig. 3). According to our hypothesis, if the entire segment of subducted continental crust is subjected to oblique divergence during exhumation, transtension structures and fabrics should characterize the deformation of UHP and HP eclogite. Our preliminary work on shear zones that contain layered eclogite (Fig. 2) suggests the omphacite crystallographic fabric is of the type encountered in L-tectonites that develop in constriction (Fig. 3). A systematic approach of this kind will establish whether constriction might have characterized rock deformation from UHP to low P.
Fig. 3: Possible P-T path for exhumation of UHP rocks of the Western Gneiss Region, Norway (Gordon et al., in press). Omphacite fabrics in HP and possibly UHP eclogite suggest constriction strain, consistent with transtension (measured by STAMP’s Roxanne Renedo and Nick Seaton). 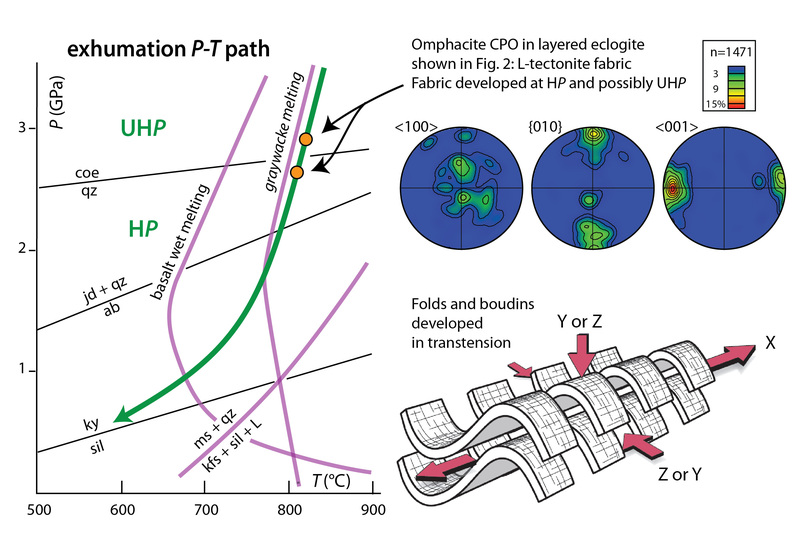 Schematic representation of fold-strain relationship in the UHP terrain; although it is somewhat counter-intuitive, folding of horizontal layering should be common in transtension/oblique divergence (fold drawing courtesy of Haakon Fossen). This current project is high on the scale of STAMPiness; it requires complete integration of structural geology (strain theory, analysis of microstructures and deformation mechanisms) with petrology and geochemistry, including thermobarometry and determination of the chemical environment and temperature of growth of datable minerals (zircon, monazite, rutile, titanite). This methodology paves the way to understanding the coupling between deformation and metamorphism during rock exhumation, a necessary condition for testing lithospheric-scale models for the return of UHP rocks. In conclusion, the STAMP approach gives the possibility for us and graduate students in particular to work on tectonic problems using a wide variety of tools in a highly collaborative environment. In addition to being scientifically sound, this approach is very fun. I thank my colleagues here and collaborators elsewhere as well as our current and former postdocs/students for creating STAMP and maintaining its spirit over the years. Gordon, S.M., Whitney, D.L., Teyssier, C., Fossen, H. (in press) U-Pb dates and trace-element geochemistry of zircon from migmatite, Western Gneiss Region, Norway: significance for history of partial melting in continental subduction. Lithos. Kruckenberg, S. C., Vanderhaeghe, O., Ferré, E. C., Teyssier, C., Whitney, D. L. (2011) Flow of partially molten crust and the internal dynamics of a migmatite dome, Naxos, Greece. Tectonics, doi:10.1029/2010TC002751. McFadden, R.R., Teyssier, C., Siddoway, C.S., Whitney, D.L., Fanning, C.M. (2010) Oblique dilation, melt transfer, and gneiss dome emplacement. Geology, 38, 375-378. Rey, P.F., Teyssier C., Kruckenberg, S.C., Whitney D.L. (2011) Viscous collision in channel explains double domes in metamorphic core complexes. Geology, 39, 4, 387-390. Rey, P.F., Teyssier, C., Whitney, D.L. (2009a) Extension rates, crustal melting, and core complex dynamics. Geology, 37, 5, 391-394. Rey, P.F., Teyssier, C., Whitney, D.L. (2009b) The role of partial melting and extensional strain rates in the development of metamorphic core complexes. Tectonophysics, 477, 3-4, 135-144. Whitney, D.L., Teyssier, C., Rey, P.F., Buck, W.R. (in press) Continental and oceanic core complexes. Geological Society of America Bulletin, 26 p., doi:10.1130/B30754.1. Hi Christian, very nice to find you (since 1994 in Montpellier), and well done it is very interesting.